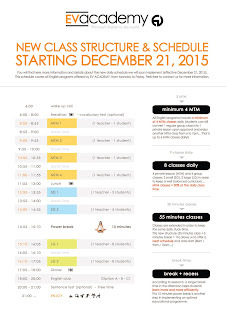 Starting December 21, 2015, all EV ACADEMY English programs will include 4 regular private lessons (MTM) daily! As usual, students can also request extra curricular MTM classes from 6 to 7pm (Monday to Thursday) and convert one large group class into one private lesson (upon approval and depending on the class and teacher's availability). Namely, EV students will now enjoy UP TO 6 MTM CLASSES EVERY DAY! Reminder: The reason for offering more MTM classes is only to answer the growing demand. - Learning through various class settings (MTM, small groups, large groups, self study...) is one of the foundations of Education as it generates more interest, more interaction, and helps you develop different learning styles (alone, by pair, by team...). With 4 daily MTM classes in our new ESL course, the current POWER ESL course will have no more reason to be and will become obsolete on December 21. Note: As you can see, there are no additional cost with these additional MTM classes for now: our price list might be reviewed next year.